Event sponsorship used to be simple. Event creators identified generic forms of exposure — like ticket giveaways, trade show booths, and logo placements — and sold them to brands. But if you still rely on this technique, you won’t win brands over. Today’s sponsors have access to digital marketing tools that help them reach their target audience more easily and at a lower cost. If you want to sell sponsorship today, you’ll need to match the return that brands get from digital ads. That’s where the latest event technology comes in. Here is how you can use new tech to pave the way for innovative and more valuable event sponsorship opportunities. Mobile event apps are a staple of modern events. These interactive apps empower attendees to take control of their own experiences — and stay connected to all your event has to offer. Using an announcement feature available on most mobile event apps, you can send attendees targeted messages. This means you can send a personalized invitation to attend a demo from a major sponsor or catch a session they’re likely to enjoy. You can also send an alert to attendees letting them know about the sponsored lounge areas — the ideal place to meet a colleague. Offering Wifi at your event helps attendees stay productive while they’re out the office. What you might not realize is that encouraging attendees to use your Wifi gives you additional insights you can share with sponsors. Modern Wifi options allow you to gather analytics about your attendee’s internet usage — from what devices they used to their general demographics and everything else in between. Understanding your audience — especially what products and services they’re most interested in — is the foundation of successful event sponsorship. Ask your venue or Wifi provider what data you can collect and use the information to attract potential event sponsors. From RFID to Bluetooth low energy “beacons,” proximity technology provides insight into what happens during your event. Attendees use these small and inexpensive devices to broadcast their location to friends and colleagues attending the event with them, as well as check into sessions. For sponsors, this tech can show how often attendees visited the trade show floor and which booths they stopped by the most. Beacons can also prompt event-goers to check out a sponsor’s booth when they come near it. This insight enables you to optimize traffic to high profile sponsors and quantify their ROI (return on investment). Virtual reality (VR) and augmented reality (AR) have graduated from buzzwords to must-have event tech. According to a recent survey, 88% of event creators planned to use VR in 2018. 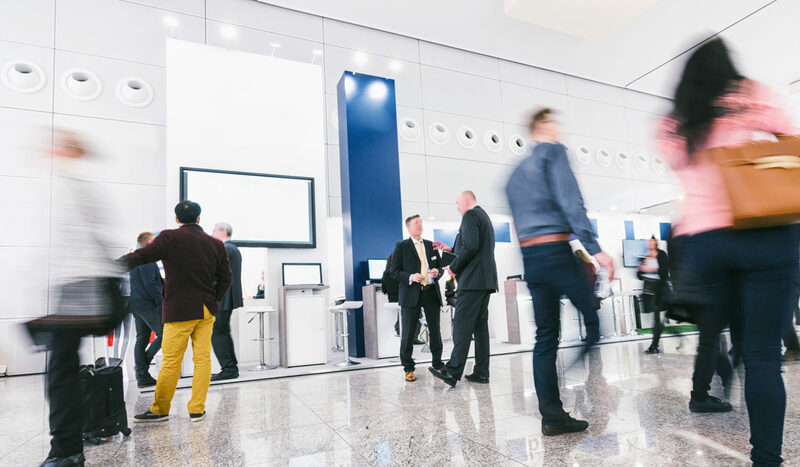 These technologies can personalize the event experience — either by opening it up to new fans who aren’t present or to add a new dimension for attendees at the event. They’re also becoming a popular choice for sponsorship activation. For example, at SWSX McDonalds used VR to transport attendees inside a Happy Meal box. Once inside, they could use virtual paint brushes, balloons, and lasers to decorate the walls. After they finished, attendees could share their creations on social media — giving McDonalds exposure to their networks. At another event, commercial van manufacturer FCA used AR to show off a new line of vans — with only one van physically present. Attendees could be customized the van with tablets to test different color schemes. AR let the company showcase all of their models without. To see if you’re ready to attract big sponsors, get this tip sheet to learn nine rules for event sponsorship success.